Our theme this month is site selection. From electricity costs and network infrastructure to the available pool of skilled workforce, data center site selection is one of the most complicated and important business decisions a company makes. Data center location affects everything from the cost of doing business and overall company agility to the quality of user experience. And, like every other aspect of the data center business, where companies choose to put their critical IT infrastructure and why is changing because of … you guessed it: the Cloud. This month, we’ll examine these trends more closely. Seeing an influx of inquiries from financial services firms about colocation at the CME Group data center outside of Chicago CyrusOne acquired in a sale-leaseback transaction announced in March, the data center provider is planning to build a 500,000-square foot building on the property to expand capacity. CyrusOne executives announced the plan on the company's first-quarter earnings call on May 5. The data center REIT, in partnership with CME, which operates some of the largest derivatives and futures exchanges in Chicago and New York, intends to nurture and grow a customer ecosystem that will be colocated at the Aurora, Illinois, campus. CyrusOne gains more tenants and sells more power, while CME benefits from more trading activity generated by both traditional financial firms as well as companies in the vibrant fin-tech startup space. 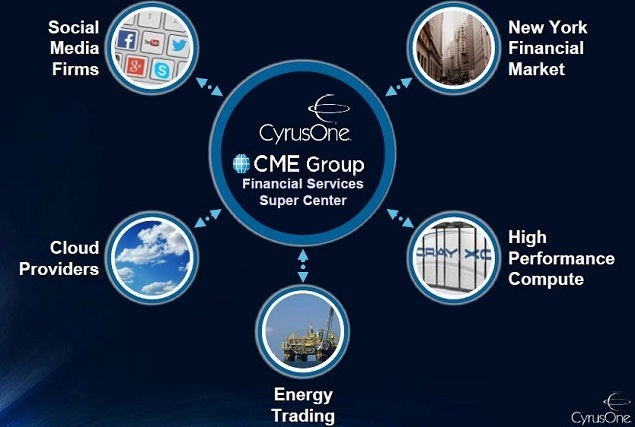 CyrusOne bought the CME data center for $130 million. CME, which was formed after the Chicago Mercantile Exchange acquired the Chicago Board of Trade 10 years ago, hosts its electronic trading platform CME Globex at the data center. CME agreed to a 15-year lease for 72,000 square feet of data center space as part of the deal with CyrusOne and will continue to host Globex there. CyrusOne currently has just 36,000 square feet of colocation capacity "available to sell" in the existing CME facility, the data center provider's CEO Gary Wojtaszek said on the call. The wording apparently implies there may be significant expansion space in the existing building which CyrusOne isn't currently able to market. He also mentioned a new 1MW customer has made a verbal commitment to take down a portion of the available capacity. The new 500,000-square foot building will be constructed on the 15 acres of expansion land that was included in the deal. Company execs did not say when they were planning to commence construction of the new building. The partnership with CME "will accelerate the goal of creating the largest financial super center in Chicago, becoming the nexus for financial, energy, social media, and cloud companies," CyrusOne said in a statement. Wojtaszek pointed out on the call that "…most of the largest hedge funds in the world are now customers, including all the large commercial banks and investment banks." Chicago has trailed red-hot data center markets like Northern Virginia, Silicon Valley, Dallas, and Portland/Seattle, mainly due to lack of purpose-built data center halls available for lease. It appears that 2016 will be an inflection point for that market. In addition to the CME facility, QTS Realty, DuPont Fabros Technology, and Digital Realty all have plans to deliver either new buildings or large megawatt-scale data halls during the second half of the year. The CyrusOne announcement reinforces the expectation that Chicago will now be in the hunt moving forward for large local and regional deployments. CyrusOne's financial services strategy began to unfold publicly during 2015, but the cadence has picked up significantly during the last two quarters. Last year, CyrusOne closed its $400 million acquisition of Cervalis, a colocation and disaster recovery data center provider with extensive operations in the New York market. Many Wall Street firms were key customers of the company, representing two-thirds of its revenue. During the fourth-quarter 2015 earnings call, Wojtaszek also announced that CyrusOne planned to expand into Northern New Jersey, one of the biggest data center market for financial services. Historically, New Jersey has served New York financial firms, but leasing velocity has slowed considerably during the past few years, according to real estate market analysts. It remains to be seen whether CME and Cervalis customers will be driving demand for CyrusOne's New Jersey expansion as well. While the large CME deal garnered all the attention, it only represented 40 percent of CyrusOne's leasing tally for the first quarter. The company also boasted wins in gaming, financial services, energy, and IT services. It added three new Fortune 1000 logos to the customer roster during the quarter. Notably, about 70 percent of CyrusOne revenue already comes from Fortune 1000 customers, a leg-up in a market segment virtually all data center providers are after today. Most data center REITs initially focused on building networks and cloud density, hosting and IT services, and serving financial services firms, which were early adopters of third-party data center services. Lately, however, these competitors have begun to focus on serving the enterprise vertical, as CIOs and CTOs become increasingly receptive to outsourcing data center capacity and setting up hybrid cloud infrastructure. CyrusOne has been calling on enterprise customers for years and continues to reap the rewards that come from being a first-mover in a market segment with a notoriously long sales cycle. CyrusOne's record Q1 results continued driving shares higher and rewarded investors with 32-percent gains year-to-date. During its fourth-quarter 2015 earnings release, CyrusOne announced record leasing activity with a $42 million booked-not-billed backlog creating momentum going into 2016. CyrusOne signed 30MW of new contracts during the last three months of 2015. During the first quarter of this year the company signed 25MW, with non-CME signings representing approximately 60 percent of the total. It has now grown the backlog to $74 million based upon annual revenues and confirmed on the call a large percentage of these revenues would commence in either the second or third quarter. From an overall industry perspective, it is significant that the CyrusOne sales funnel remains just as strong as it was last quarter despite the large bookings during the past two quarters. Its Fortune 1000 enterprise-first focus continues to pay huge dividends for shareholders. On May 6, CyrusOne shares closed up over 3 percent, recording another all-time high of $48.97 per share.